View a recording of Dr. Appelt's talk with accompanying slide show here. The United States has experienced a marked uptick in rates of both maternal mortality and morbidity. African-American women and infants are disproportionately affected by this current health crisis. This community-engaged research represents a qualitative exploration of the varying perspectives, identities, and social relationships among African-American women in an inner-city neighborhood in Pittsburgh, Pennsylvania. Emergent themes from focus group discussions with 49 residents and leaders in the community suggest the existence of multiple identity-based "wisdoms" related to maternal-child health. Preliminary findings indicate the importance of identity in conceptualizations regarding the causes of and community-based solutions to this current health crisis. 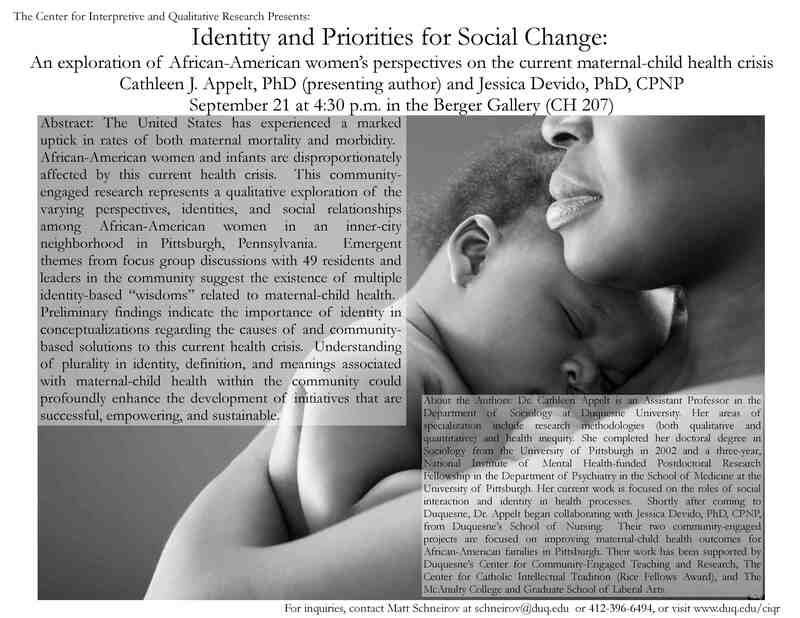 Understanding of plurality in identity, definition, and meanings associated with maternal-child health within the community could profoundly enhance the development of initiatives that are successful, empowering, and sustainable. Dr. Cathleen Appelt is an Assistant Professor in the Department of Sociology at Duquesne University. Her areas of specialization include research methodologies (both qualitative and quantitative) and health inequity. She completed her doctoral degree in Sociology from the University of Pittsburgh in 2002 and a three-year, National Institute of Mental Health-funded Postdoctoral Research Fellowship in the Department of Psychiatry in the School of Medicine at the University of Pittsburgh. Her current work is focused on the roles of social interaction and identity in health processes. Shortly after coming to Duquesne, Dr. Appelt began collaborating with Jessica Devido, PhD, CPNP, from Duquesne's School of Nursing. Their two community-engaged projects are focused on improving maternal-child health outcomes for African-American families in Pittsburgh. Their work has been supported by Duquesne's Center for Community-Engaged Teaching Research, Center for Catholic Intellectual Tradition (Rice Fellows Award), and The McAnulty College and Graduate School of Liberal Arts.